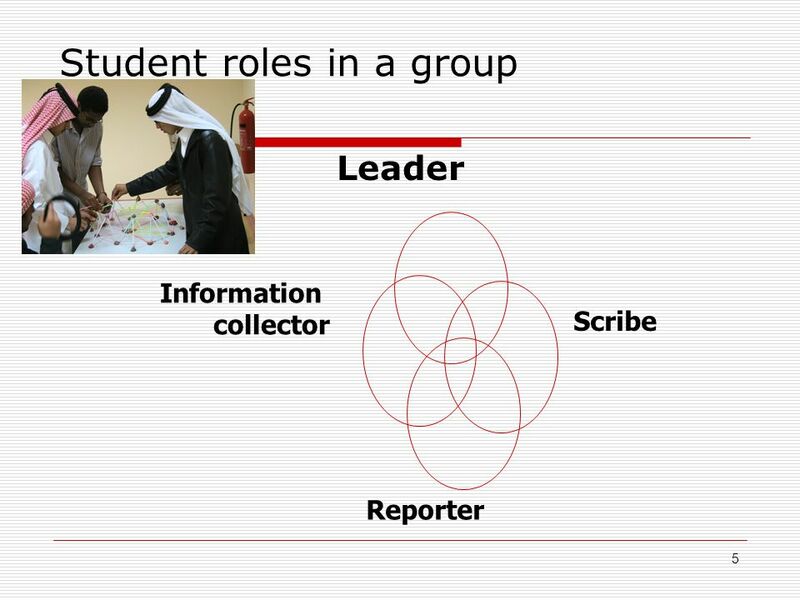 1 Using Groups Effectively to Meet Learners Needs Mohammed Bin Abdul Wahab Secondary School for Boys. 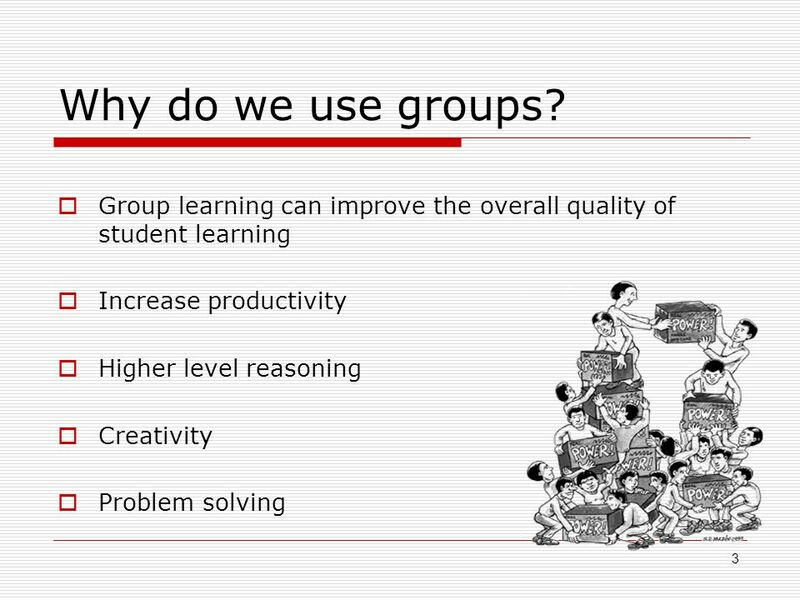 4 4 Grouping strategy Groups can be created by: teacher selection, student selection, random allocation or a combination of the three. 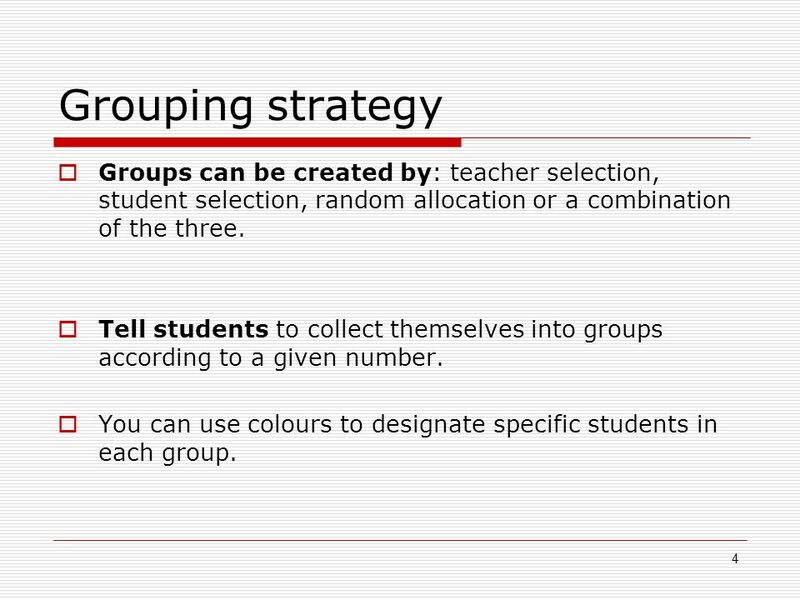 Tell students to collect themselves into groups according to a given number. You can use colours to designate specific students in each group. 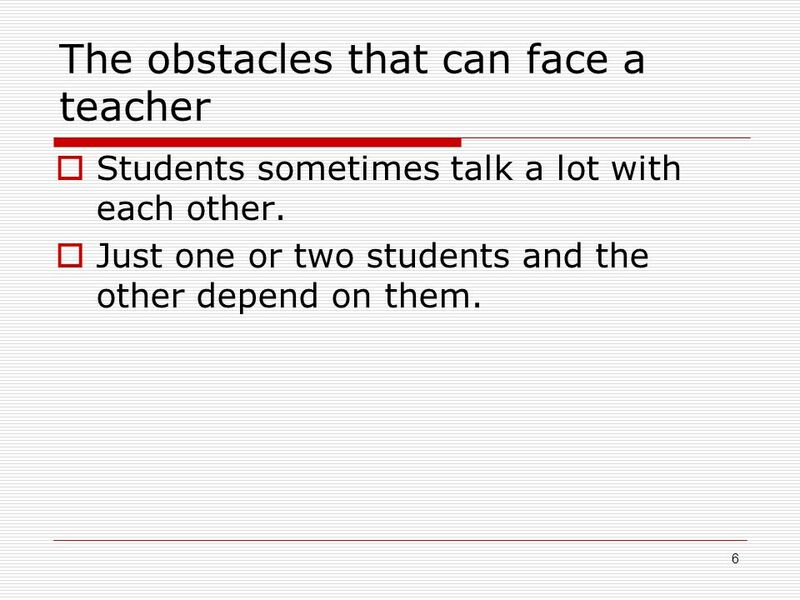 6 6 The obstacles that can face a teacher Students sometimes talk a lot with each other. Just one or two students and the other depend on them. 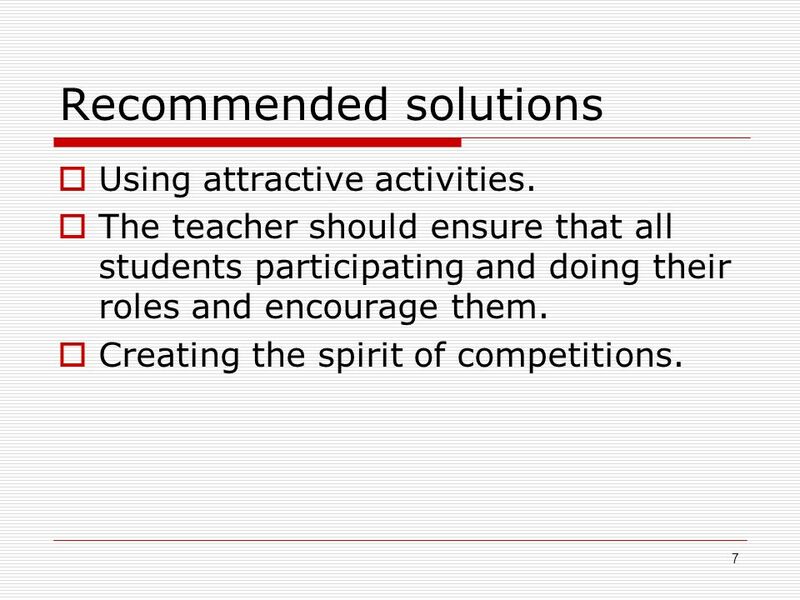 7 7 Recommended solutions Using attractive activities. The teacher should ensure that all students participating and doing their roles and encourage them. Creating the spirit of competitions. 8 8 Suggested activities Read and talk through the sheet with some suggested activities on them. Discuss how useful each would be in your own subject area. 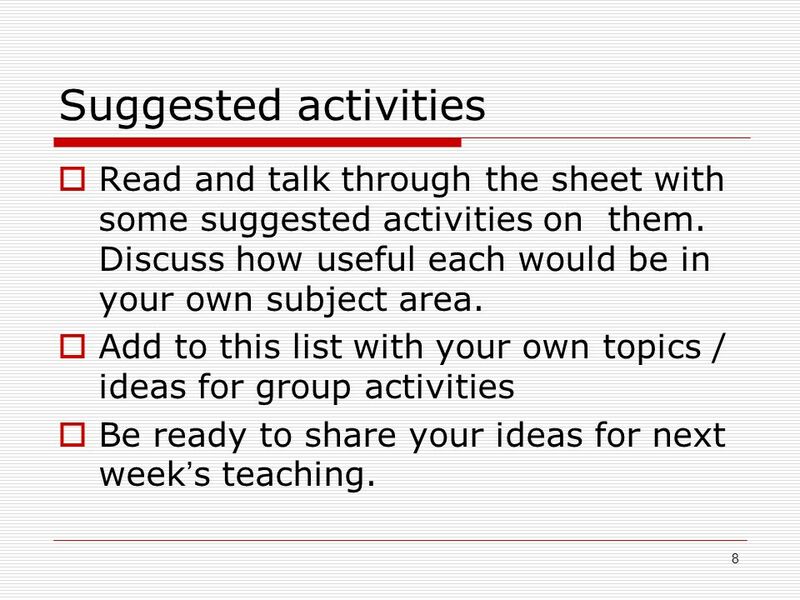 Add to this list with your own topics / ideas for group activities Be ready to share your ideas for next week s teaching. 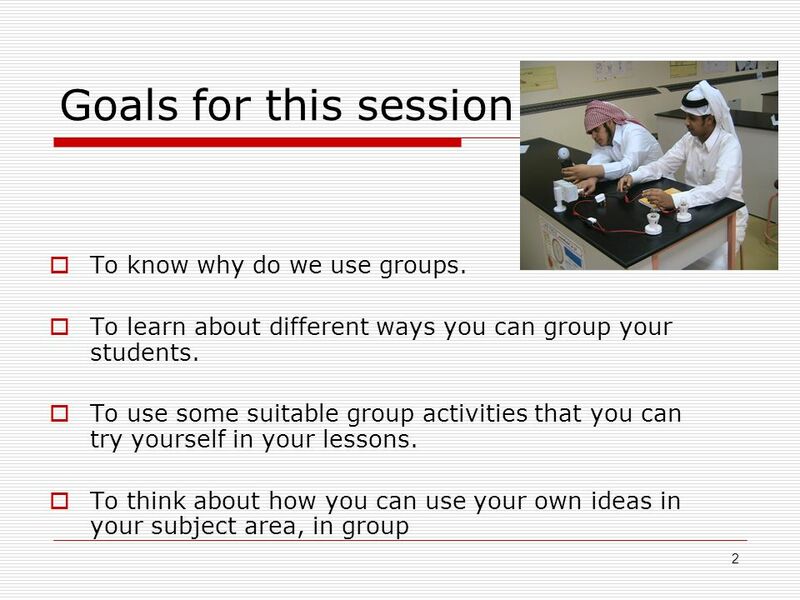 Download ppt "1 Using Groups Effectively to Meet Learners Needs Mohammed Bin Abdul Wahab Secondary School for Boys." Questioning Language, either written or spoken, helps us to think. Enterprise in Education Dunbar Primary School 18 May 2007. How does collaborative group work affect science learning? Back to menu Back to menu Back to menu Back to menu1 Pass! Ask the teacher a question about today’s lesson! Competency: 6.13 EALRs: Writing 2.1, 2.2, 2.4, 4.1, 4.2 Communications 3.1, 3.2, 4.1, 4.2 Reading 2.1 Creating Engaging Lessons. The Five Fundamental Truths of Firm Management Strategies For Owners and Managers. Session Objective To understand how to set high quality learning objectives and learning outcomes Session Outcomes By the end of this session you will. In this activities, the main component is the active contribution of learners with personal opinions that can not be predictive before hand. They involve. National Curriculum September 2014 Key Stage 1 and 2. The Conditions of Learning Joanne. The Learning Task Student will be able to complete an effective article search on the Ebsco databases. Learned Capability. Stefanie Florczyk. P UPIL PREMIUM Pupil premium were disengaged and lacked resilience, which hindered progress. In summer 2013 Victoria Junior School. iMET Presentation Mica Brown Christie Speed May 4 th,2001. Ind ENTREPRENEURS MUST BE ABLE TO THINK CREATIVELY!  Solve problems  Generate, develop, and communicate new ideas. Nrich department meetings A teacher’s perspective Asnat Doza. Session 2 Big Ideas Building a Solid Number Foundation Strategies for Education Assistants 1. When we met back in October... Discussion took place: – issues that arise from doing group work – encouraging students to talk – spreading this practice.